There are many methods applied to bolster the short circuit withstand capability of the transformers: improvement of the materials, reforming of the design and good maintenance in the operation process and so on. However, this article deals with methods for the transformers which are in use and those which are hard to modify or expensive to modify. Usually, the probability of power systems encountering single phase short circuit accidents is much higher than the probability of power systems encountering three-phase short circuit accidents. 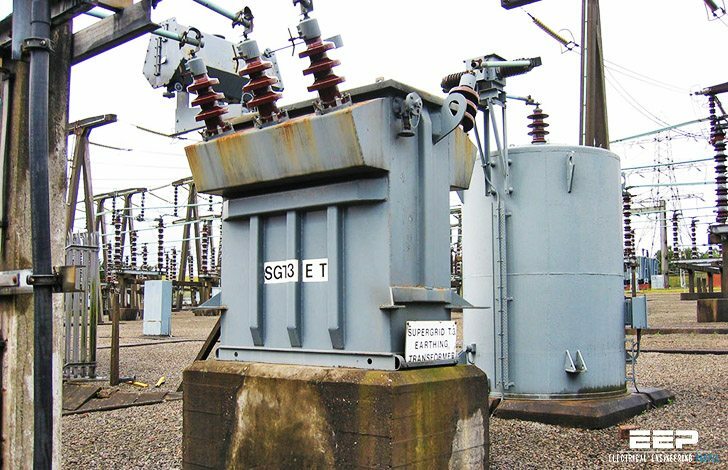 The reinforcement of the short circuit withstand capability for the transformers can, to a great degree, reduce the ruin of an short circuit accident. The single phase short circuit current is affected by the positive sequence impedance and zero sequence impedance. 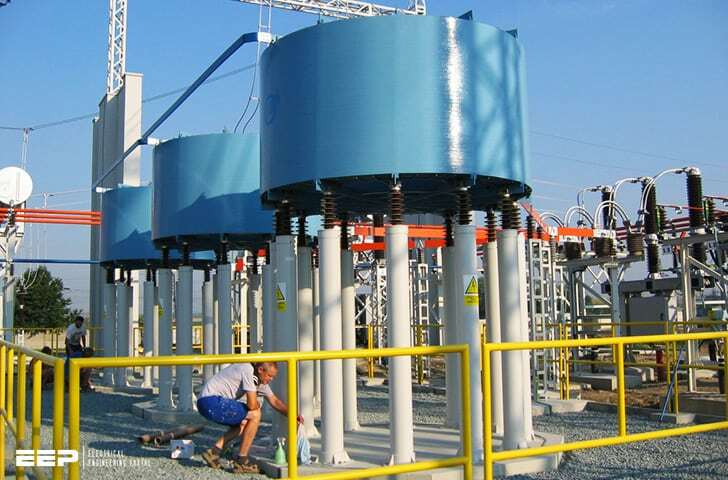 One effective way to change the zero sequence impedance is changing the earthing methods of transformer neutral points, or installing the neutral grounding reactor. 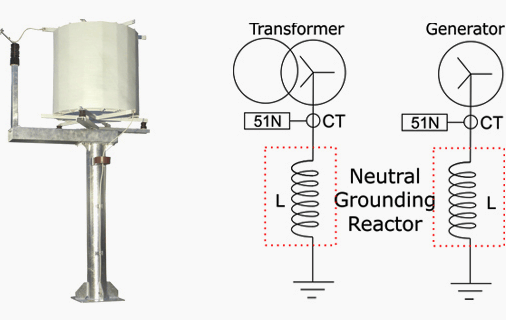 Neutral grounding reactors are used for low-impedance grounding of the neutral point of three-phase networks in order to limit the fault current in the event of a phase-to-ground short circuit (fault current will be limited to the level of the phase-to-phase short circuit current). One reactor terminal is connected to the neutral of the network and the other terminal is grounded. During normal operation of the power system the current flow through the reactor is almost zero, since it is only driven by the imbalance of the three-phase network. The ordinary installation place of the neutral reactor is in the compensation equipment called HV shunt reactor. In China, people often use the star connection for the HV shunt reactor, and then add a reactor in series at the neutral point of the star connection. That’s so called “high-voltage reactor grounding through small reactance at the neutral point”. 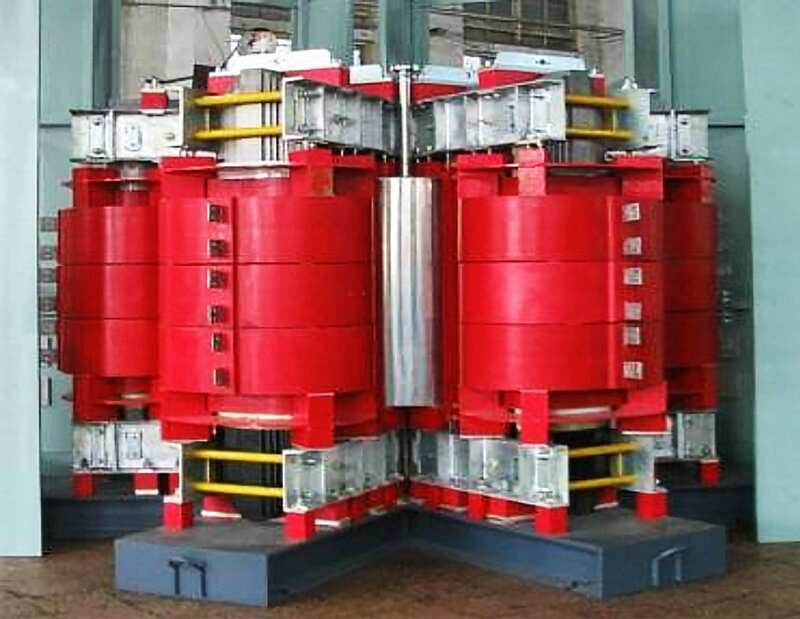 The functions of reactors here are to compensate the phase to phase capacitor and grounding capacitor, speed up the termination of the secondary arc current and to make it easier to adopt the single-phase reclosers. One application example happened in 2004, in Ningbo City, Zhejiang Province,China. Engineers installed little reactors which are 15 Ω as the neutral earthing reactor for a 500kV transformer in Lanting Substation. The short circuit current decreased. When the neutral points connect with reactors, the zero sequence impedance will change. The grounding short circuit current of double phases may be larger than that of the single phase. So it’s necessary to check both the single phase short circuit and double phases short circuit after the installation of a neutral reactor. The series reactor is a high-voltage electrical apparatus designed to limit the current of a short circuit and maintain adequate voltage on the buses of distribution switchgear during a short circuit in a network. It consists of an inductance coil. Such reactors are also used to compensate reactive power in order to improve the transmission capacity of power lines. The use of reactors is a traditional and commonly used method for the limitation of the short circuit current. The reactors are usually installed at the areas where the short-line-fault may happen and connect in series in the circuits which require a limit to the short circuit current. The principle is decreasing short circuit currents by increasing the impedance of the circuits. The advantage is that it’s easier to install and run in safe and reliable ways. The disadvantage is that the reactor will increase the losses of power. It may influence the stability of the power system. The current limitation series reactor is usually applied at outlets of the LV side, and can also be applied at the 35 kV medium side in 220 kV transformer. This method is suitable for both three phase short circuit and single phase short circuit. The example is ABB’s project for the Metro Grid. They build a series reactor which transfers the power from Sydney South to Haymarket Substation in Australia. It’s the biggest reactor made by ABB. The representatives of fast switches with high capacity are Is-limiter (made by ABB), Pyristor (made by Ferraz) and C-Lip (made by G&W). This kind of switches can protect electric devices from larger short circuit current shocks and prevent large-area electricity black-outs caused by the destruction of main equipment due to overcurrent. It is a fault current limiting device that uses chemical charges and current-limiting fuses to interrupt the fault current within the first quarter to half cycle (i.e. before the first peak). In a typical Is-limiter design, the device is composed of two current paths connected together in parallel. One path is an element rated for the full load current (which can have high continuous current ratings, e.g. 3000 A), and the other path provides the current limiting function via a current-limiting fuse (which typically has a continuous current rating of <300 A at 15 kV). The work principle can be described as follows: when the short circuit happens, the current transformer module detects the signal and transfers it to the control module. Then the control module is triggered and turns the disconnector on to ‘move’ the short circuit current into the fuse module at the instant. Here, the current is cut off. The interesting thing and special feature is that the device uses the explosive to get the rapid cut-off ability. It can limit both short circuit currents of single phase and three-phase. Fault Current Limiter (FCL) is also called Short Circuit Current Limiter (SCCL). There are several different types: Superconducting Fault Current Limiter (SFCL) and the controllable Fault Current Limiter which is based on electronic technology and so on. The working environment is quite harsh: the high-temperature superconductor needs liquid nitrogen (N2). The critical temperature is 77 K (about -196 ℃). And the low-temperature superconductor needs liquid nitrogen liquid helium (He). The critical temperature is 4 K (about 269.15 ℃ ). 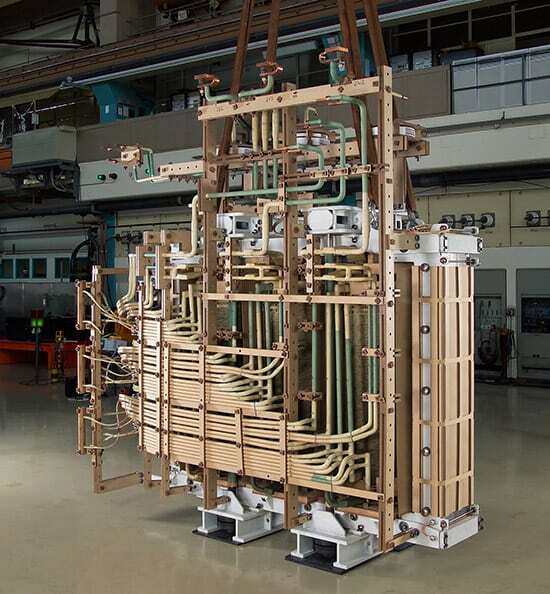 Once the working temperature is over the critical temperature, the SFCL will not able to keep the superconductor character. The technique is not mature enough. In China, there are only two prototypes running. The number of SFCLs which are running in Switzerland, Germany, Great Britain and USA is less than 20. So it’s not suitable to be applied for modifying the transformers that are running now. However, the controllable Fault Current Limiter based on electronic technology is more mature than SFCL. There are two types: series and parallel. The operation principle is: use the electronic apparatuses to break or connect the circuit with high speed. Then the capacitor, the resistance, or the inductance in series or in parallel at bypass works immediately to increase impedance of the circuit in order to limit the short circuit current. The controllable FCL shown is the series type. It consists of the capacitor (C), the inductance (L) and a bypass switch (K). Normally, the switch doesn’t work and it’s open. L and C work on the series resonance condition. The impedance could be regarded as zero, compared with the total impedance. So the influence of FCL could be acceptable. When accidents are detected, K receives the command and closes to take C away instantly. The inductance (L) begins to limit the current at the moment, so that the fault current is limited. Less occupied space. The weaknesses are high cost and the maintenance. In the practical work, the risk of three-phase short circuit accidents at the MV side of 500 kV and 220 kV transformers is quite little. The main risk is the single phase accident. Bolstering short circuit withstand capability of the single phase or the limitation of the short circuit current at the single phase can reduce the number of transformer short circuit accidents significantly. In Table 2 above, we can find that the new devices work more effectively and respond much faster, but they are defeated by the traditional ways in the economy, the reliability, the maturity and the maintenance experience. So the best selection is to install the neutral reactor. If there does exist the need for three-phase protection, we can install the fast switch or FCL. For the LV side accident, people can opt to install current limitation series reactors, or fast switches if the space is limited. The use of current limiting reactors has the down side of voltage drop. What I suggest is the use of current limiting reactors to mitigate arc flash But let the reactors be short circuited by a breaker during normal operation and brought into current limiting function only under a short circuit or an arc flash condition when applied to a MV source. The arc flash sensor can trigger the breaker. And one can set up cascading reactors, depending on the severity of arc flash. in the standard arc flash mitigation scheme a three phase short circuit is created to trip the breakers . This has a serious damaging effect on the transformer upstream. Using current limiting reactors prevents that.